This past Saturday, the Richard Thompson Classic was held for the second consecutive year with over 32 teams gathering at South Mountain High School in late February. A field that included elite athletes from Page and Scottsdale Prep, competing against Arizona powerhouses like Chandler and Desert Vista and even Rancho Verde from California demonstrates that it is more than possible to drop impressive times and marks in chilly February. First came the Girls 3200-meter run, with Rachel Turner (Chaparral, Jr.) and Kimberly Lima (Rancho Verde, So.) taking control of the race, while Tiaree Towler (Chaparral, So.) tagged along in third. With 300 meters to go, Rachel pulled away and took her first victory of the season in 11:34, followed by her teammate Tiaree in 11:38. Lima would finish 3rd in 11:40.66. Next in the High Hurdles, Jai Gruenwald (Chandler, Sr.) and James Smith (Westwood, Sr.) set meet records of 14.46 and 14.90, respectively and they were the only ones who ran under 15 seconds for the High Hurdles. James would go on to break his own meet record in the Intermediates as well setting a new standard of 38.05. In contrast Jai took the win in her signature event, the Long Jump, with a mark of 18-11, though she hopes to reach 20 feet in her final season. After the Hurdles came the 100 meters and while the sections generally progressed into consecutively faster fields with Zaire Chest (Chandler, Sr.) winning the final or 'elite' Section, the fastest girl performer for 100m was Ma'kayla Dickerson (Betty H. Fairfax, Jr.) out of Section 2 with a time of 12.43. She later ran the fastest 200m of the day in 25.17, again out of the second section. For boys, Christopher Russell (Cesar Chavez, Sr.) won the 100 in 11.04 and the 200-meter dash with a PR of 21.98. Meanwhile in the Pole Vault, juniors Madeline York (Hamilton) and Sevanna Hanson (Desert Vista) both cleared 11-03, with Madeline taking the win. Higley's Makel Hubbard (Sr.) cleared 6-06 to win the Boys High Jump. For the Boys 1600, David Nelsen (Hamilton, Sr.) led with a steady pace surging over the last half to split sub-65 quarters to dominate the field by over ten seconds in 4:25.46. Travis Kearney (Desert Vista, Jr.) took 2nd in 4:35 to hold off Gabriel Garcia (Chandler, So.) in 4:36, while Noah Creighton (Hamilton, Sr.) dropped a big kick on the bell lap to finish 4th in 4:37.72. In the throws Karsten Santaella (Scottsdale Prep Academy, Sr.) and Marcos Figueroa (Desert Vista, Sr.) dominated both the Boys Disc and Shot competition far ahead of the rest of the field and effectively smashing their qualifying standards for the AIA State Championships in May. On the girls' side, Samantha Ponds (Sr.) and Ciera Jackson (So.) scored the 1-2 punch for the Chandler Wolves in the Shot Put with marks of 41-02.5 and 40-02 while Kiara Anderson (Dysart, Jr.) took home a bronze with a throw of 37-11. For the boys 3200, the Desert Vista Thunder had attracted the attention of David Nelsen and Bowen Martin (Page, Jr.) ready to toe-the-line against the NXN finalists. 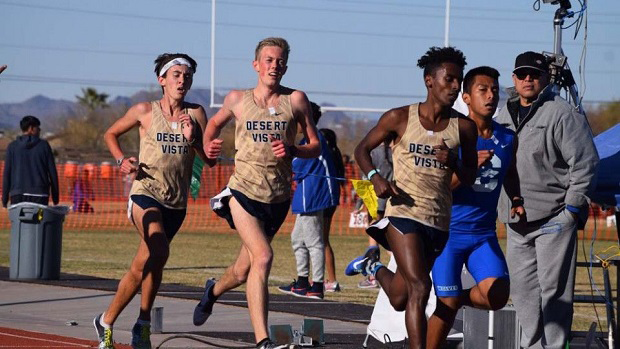 Habs Cheney (Desert Vista, Sr.) and his fellow Senior teammates Reece Donihi and Aksel Laudon, "the goal was to get as close to 9:20 as possible," and in the end their pace proved to be too much even for Martin and Nelsen who took respective finishes. Though they came up short of their goal, Aksel and Reece clocked in at 9:29.16 and 9:35.38, both within three seconds of their lifetime bests, and Habs came away with a big PR of 9:31.02. As always, the day ended with some spectacular 4x4 relays, first with the girls coming down to the wire between sophomores Jadyn Mays (North Canyon) and Armani Harris (Chandler). Though Jadyn had won the Open Elite 400-meter dash over Armani by almost a second earlier that afternoon, Harris was able to hold off Mays and deliver the victory for the wolves in 3:56.07. The Chandler Boy's 4x400m relay outran last year's CIF D1 State Champions, Rancho Verde Mustangs. 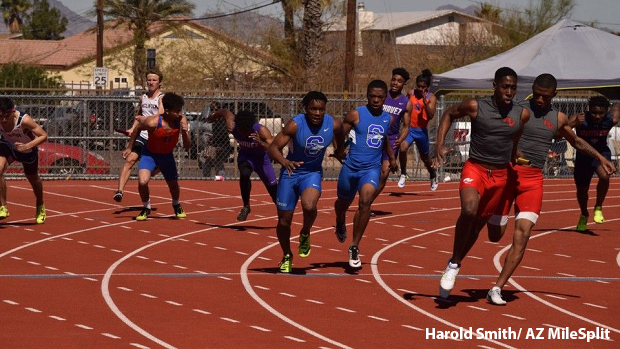 Earlier that day, in the 4x100m Relay Chandler ran 42.30 over Rancho Verde's 42.61 and determined to finish with a win, the boys held it down for Arizona in 3:27.36. The Richard Thompson South Mountain Classic, has once again delivered quick times and challenged more athletes to prepare earlier. Best wishes to Arizona athletes this outdoor season.